This 45 RPM Grister convertible flour mill is essentially same as the Mil-rite mill except it does not have the electrical motor attached to it. 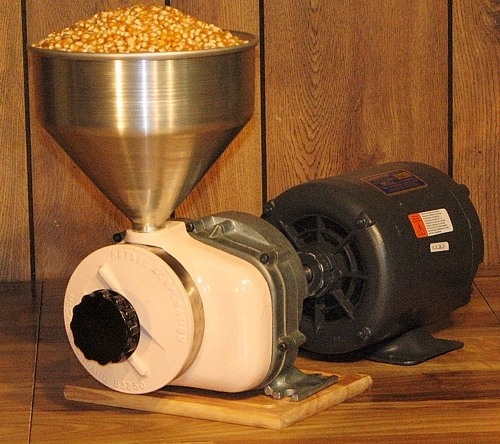 Grister convertible flour & cereal mill comes with your choice of the stones or burrs. You may purchase the additional grinding wheel (either the ceramic stones or stainless steel wheel, part number 1818S or 1818B respectively) together at the time of purchase or at a later time. Owners manual is included. Comes in 12 different colors of your choice. Because all the parts that fit the Mil-rite will also fit the Grister, obtaining new parts and performing do it yourself repairs will not be a problem. The same grain funnels that fit the mil-rite will also fit the Grister. The schematic diagram for the mil-rite is identical to the Grister's and all the parts are interchangable and are always available online. Just like the Mil-rite, the Grister has a 10 year manufacturer's warranty. This warranty covers all defective parts for a period of 10 years. This unit is a special order item and can only be purchased with a check or money order. All Gisters are a special order items and a 50% restocking fee may apply if used and returned. A full refund applies if returned unused. The Grister's most popular power source is an electric motor. The possibles alternatives, however are unlimited. It can be easily powered by means of pulleys, chain and sprocket or any type of direct coupler of your choice. The Grister comes standard supplied with 5/8 direct drive coupler. The following coupler sizes are also available upon request: 3/8 inch, 1/2 inch, 3/4 inch and 1 inch. Metric: 5mm, 6mm, 7mm, 8mm, 8,5mm and 9mm for International shipments. A 1/3 HP or larger motor can be mounted to the input shaft in the rear of the unit by means of a direct coupler. Because the precision helical gears are already in the reduction box, the mill is designed to operate quietly and best at motor speeds of 1500 to 2000 RMP at the input shaft. 1725 RPM electic motor on the input shaft will turn the stones at about 45 RPM, which is the same as the Mil-rite. The electic motor is not included and may be purchased for about $130.00 from our online store or acquired at your local hardware store. We have a large inventory of single phase, 110, 220, and 340 three phase motors, both 110 volt and European 220 Volt requirements. Please feel free to e-mail our service techs at anytime if you have any questions and we will be glad to help you.